EAST HARLEM — A caring father, a loving mother and an aspiring chef, all victims of last week's building explosion, were memorialized Wednesday. Friends and family honored Rosaura Barrios, 44, and her daughter, Rosaura Hernandez-Barrios, 21, in a joint funeral at RG Ortiz Funeral Home in East Harlem. The two women died in 1644 Park Ave. during the blast. Oscar Hernandez-Barrios, the son and brother of the two women was critically injured in the blast. He remains in Harlem Hospital. Friends of Rosaura Hernandez-Barrios described her as a kind, compassionate young woman who encouraged her friends to reach their goals. "She was very sweet. She would always ask you how your day was going. She wanted to know how everything was going," Bianca Rivera, who had known her since middle school, said outside Ortiz Funeral Home in East Harlem. "She convinced me to graduate. She told me not to give up." Hernandez-Barrios worked on the line at Triomphe in Midtown, where she was described as an exemplary employee. "She would always cook Fettuccine Alfredo and it was the best thing ever," Rivera said. Jahana Cierra, 20, another old friend, said caskets for the mother and daughter sat side-by-side with photos of both women nearby. White, red and green flower arrangements framed both coffins. Her father and sister sat weeping at the front of the room, Cierra said. "[The father] told me to stay strong because she's still looking over us." Earlier in the day, George Amadeo, 44, was remembered at the same funeral home. Amadeo, 44, is thought to have died beside his beloved cocker spaniel Blackie in the rubble of 1644 Park Ave.
Friends described him as a "smart, intelligent, loving, caring" man who doted on his family. Amadeo was born in 1969 and grew up in both East Harlem and The Bronx. He graduated from Adlai E. Stevenson High School in 1986 and stayed in Harlem to take care of his mother, his friends said. It was there that he met the love of his life, Irene, and the couple later had a son, Elvin. 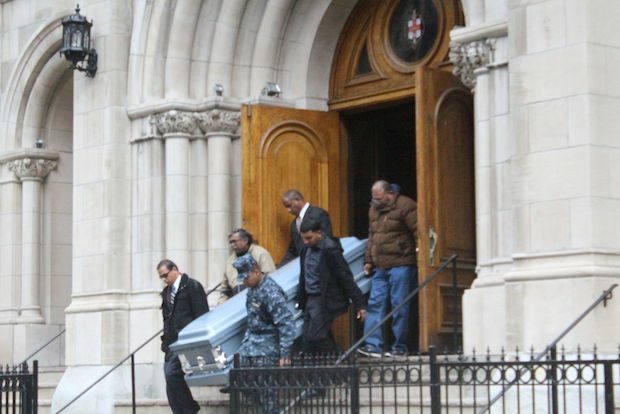 Dozens of black-clad mourners gathered at St. Paul’s Roman Catholic Church on East 117th Street for the hourlong funeral Mass. Mourners sobbed as Amadeo’s casket was carried out of the church and placed inside a silver Cadillac hearse following the service.